I've been on somewhat of a potato kick lately. I offer no explanation. These things just happen every once in awhile. My latest spud endeavor, in part, comes from a restaurant down the street. For the last several months, they have had freshly made potato chips as a rotating appetizer. They take a small bowl, fill it full of chips, and finish it off with an array of cheese and garlic toppings. They are fantastic and, after downing a pint of beer, I also decided, perfect for the grill. Instead of frying, I opted for parboiling and planking. The parboil helps the cooking process, and the smoldering plank adds another layer of flavor. Initially, I wasn't sure what to call these. 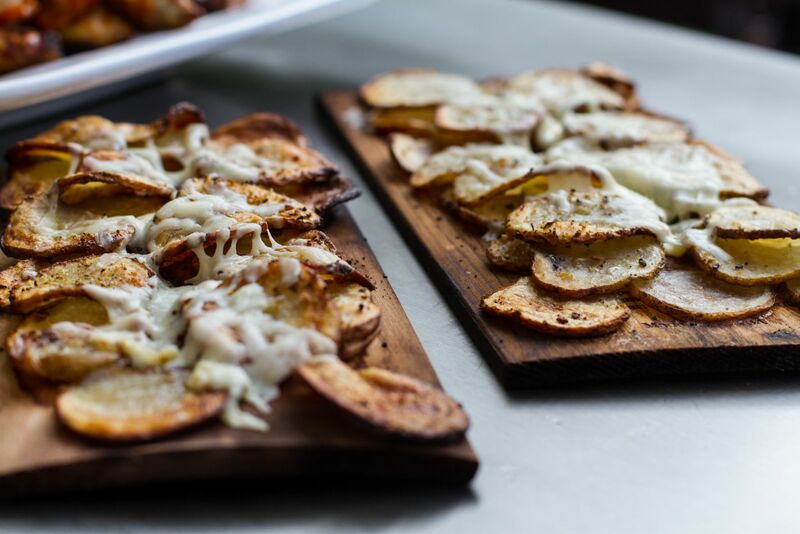 Are they potato chips, or just planked scalloped potatoes? Call it what you will, I just like to eat them. 1. For slicing the potatoes, I highly recommend the use of a mandolin. It makes prep time more efficient and certainly more accurate...just watch those fingers. 2. 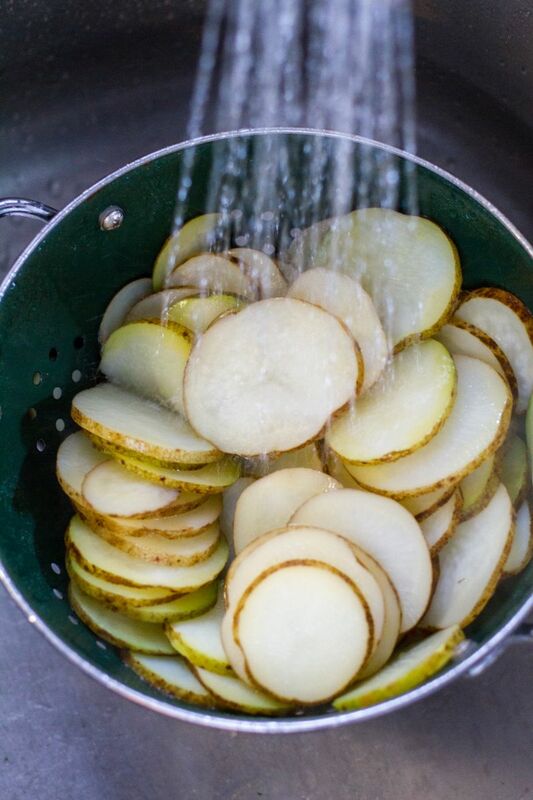 Place the sliced potatoes into a large pot of boiling water. Cook for 10 minutes then promptly dump potatoes into a colander and, to stop the cooking, cool under running cold water. 3. Once cool, place the potato slices on the soaked planks. Maximize potato to wood contact as much as possible, realizing some stacking of potatoes will happen. Season evenly with salt and pepper. 4. Mix together the garlic and olive oil in a small bowl. Brush the olive oil mixture on the potatoes. Add the cheese. 5. Prepare a grill for direct medium heat (350 F). 6. With the grill heated, place the planks on the grill, directly over the coals, and lower the lid. 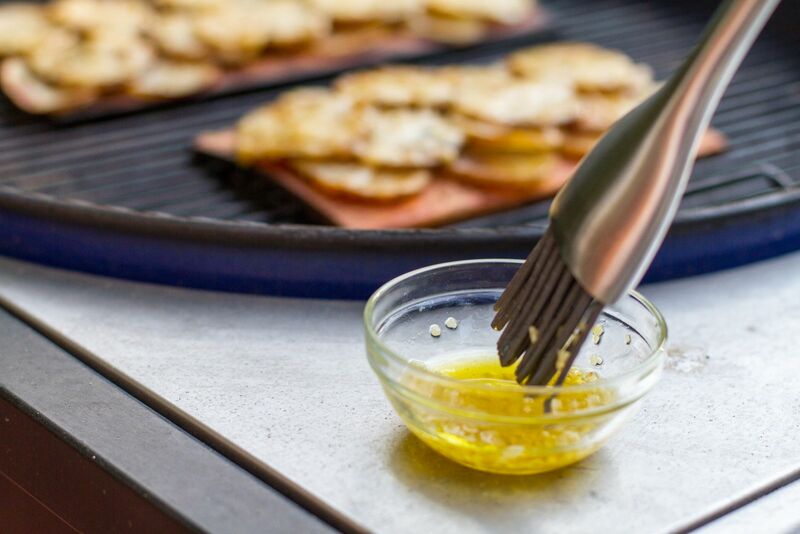 Grill for approximately 30 minutes, basting the potatoes with the olive oil garlic mixture every 10 minutes. 7. 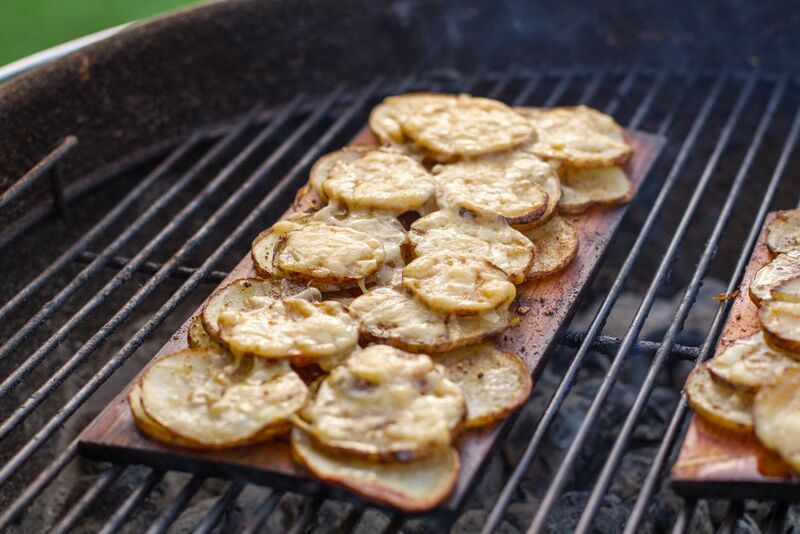 If you prefer an even crispier potato, move the planks to indirect heat and grill an additional 10-15 minutes. This is a simple side dish that packs a ton of flavor and best yet, can be topped with just about anything. Also, if you were wondering where you've seen them before, they were front in center in my Night at the Grill video!